Re (the Capita joint venture that runs, planning, environmental health trading standards and many other regulatory services) were paid £20.36 million. That includes their monthly contract fee of £ 4.2 million plus assorted small payments plus one large one for £15.92 million. I will have to investigate why so much was paid to Re and for what - the summary merely says "various"
Capita were also paid a fraction under £2 million on the Customer Support contract. I find this surprising given that, as the recent audit meeting identified, "as at 31 March 2017, the Council has a prepayment balance of £44.7 million in respect of its Customer and Support Group (CSG) contract". Barnet keep saying they are hard up and have to make cuts to key services, yet they can afford to make a massive advance payment to Capita. We were supposed to receive a credit of £500,000 for making the advance payment last December but so far I have seen no credit for this amount (but I have seen a bill for £500k in May - I wonder if they got it muddled up?). 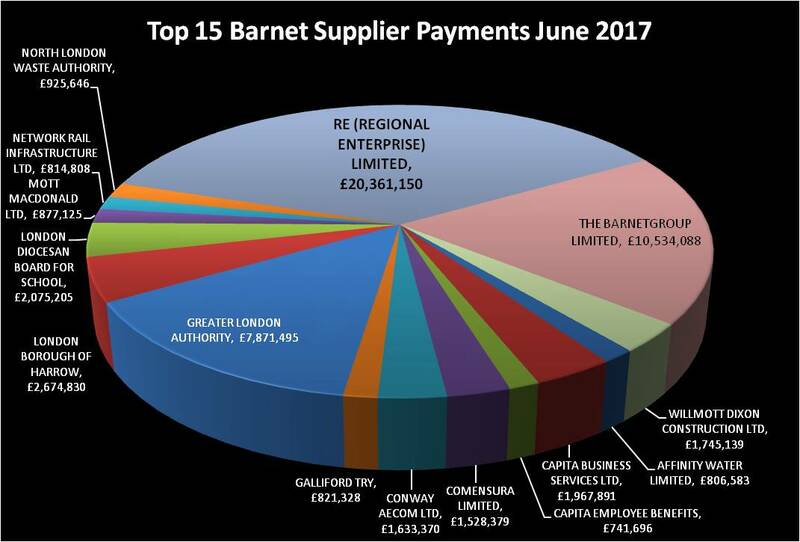 Comensura , through which all agency and interim staff are consolidated, billed Barnet £1.53 million in June. There was talk of the Council making major inroads into the agency staff bill, but in the first three months of this financial year they have already spent £4.23 million which doesn't bode well. At a more micro level, yet again the council's desire for town twinning meant a nice party at The Haven Bistro & Bar in Whetstone. This happened last year as you can read here. This year they spend £30 less but still managed to run up a bill of £1,521.90. Given everyone is being asked to volunteer and councillors do receive a generous allowance, especially if they chair a committee, I would have expected each attendee to have chipped in £50 to cover the bill. But this is Barnet and they don't do things that way here.